Toronto is bailing out and mopping up after last night’s deluge. Environment Canada had issued a special weather statement earlier in the evening, forecasting between 50 and 100 millimetres of rain, particularly near the lakeshore areas of the city. 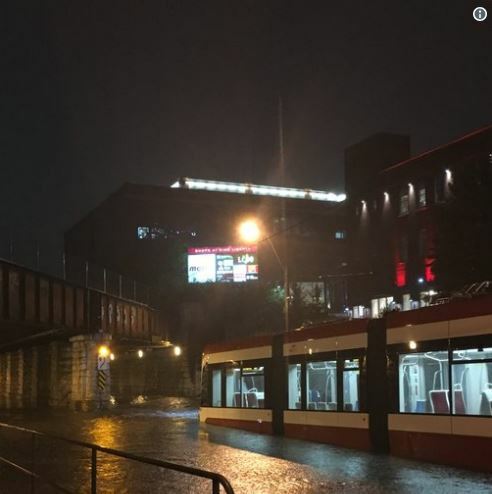 Cars were water-logged and stranded under bridges, thousands of fans at the Blue Jays game had to wade through ponds of water that accumulated in some of the pathways in the Rogers Centre, and the Royal York Hotel had water flowing out of the ventilation system in the lobby, as the city was overwhelmed with the rain. Several of the condo towers had rain water pouring down through piping and ventilation systems. 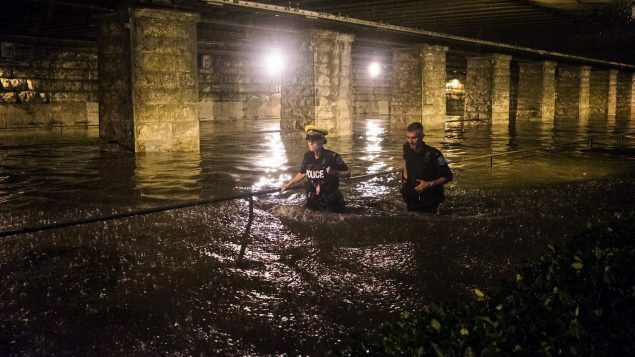 One of the worst cases was a flooded elevator in a basement garage where cars were parked, that left two men with less than a foot of airspace. Police got there in time to eventually rescue the men. Flash-flooding left cars floating in ponds of water that accumulated when the drainage systems was overwhelmed. And there is more rain in Toronto today.